Just a quick note; if you shop at Teavana (or are considering it), please read this. 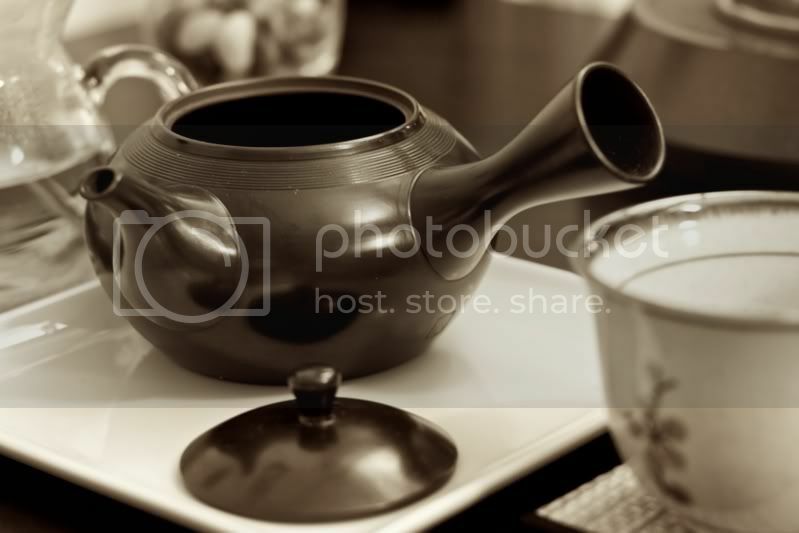 I have never been a fan of Teavana, but the prescribed sales methods described in this account (not to mention the behavior of Teavana owners) are revolting. I will never give them another dime. I will no longer be checking emails sent to admin@teanerd.com. It was a pain anyway (Booooo POP3), but then I started getting quite a bit of spam. If for some crazy reason you actually want to converse with me, you can find an email address on the About Me/Contact Info page (link is to the left). Sorry for the confusion. Given my penchant for obsession and preference for the totally impractical, it's really not surprising that I would eventually develop (oh yes, pun very much intended) an interest in film photography. I'm just getting started, but I am encouraged by the results of my first few rolls. 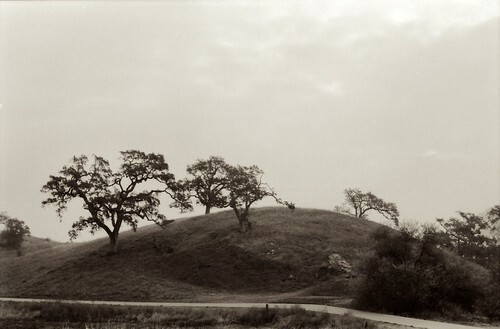 I think film has so much more character to it. 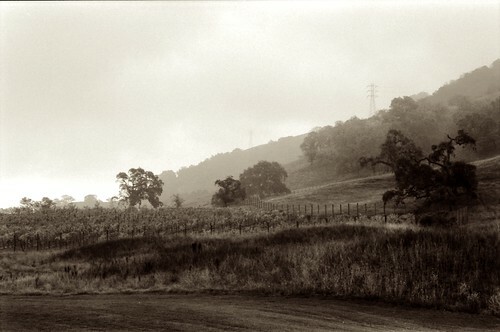 Even aside from the medium itself, using film has indirect effects on the photographic process. Most importantly, it makes me slow down and actually think about composition and exposure, rather than just doing rapid-fire, hope-I-get-something-useable bracketing. Fortunately, my TAD (teaware acquisition disorder) has gone into remission lately. I say it is fortunate because I now lust over lenses and cheap Soviet rangefinders (cheap is, of course, a relative term). 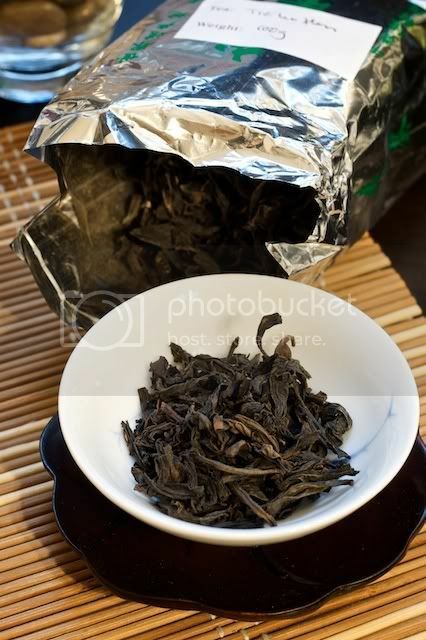 Tie Luo Han is the name of one of the Si Da Ming Cong, the four famous varietals of Wuyi yancha, which also includes Da Hong Pao, Shui Jin Gui, and Bai Ji Guan. 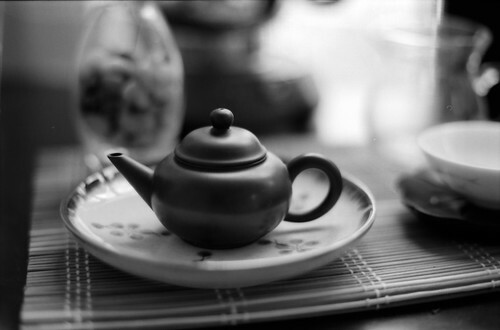 "Tie" as in Tie Guan Yin, means "iron." "Luo Han" is translated into English as a number of different things (including Warrior Monk, Apostle, etc. ), but it is really the Chinese version of the Sanskrit word "arhat", meaning "noble one." An arhat is, basically, a follower of the Buddha who has achieved enlightenment. Though an arhat has reached Nirvana, he/she is not regarded as highly as a Bodhisattva (such as Avalokiteśvara/Guanyin, the Bodhisattva of Compassion, for which Tie Guan Yin is named) or a Buddha. According to Theravada buddhist teachings, arahantship is the highest goal most can obtain, whereas buddhahood is the ultimate goal for Mahayana buddhists. 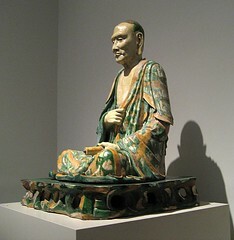 A 10th-12th century depiction of a seated Luo Han. Photo by Maulleigh. In Chinese Buddhist mythology, there are several Luo Han (traditionally seen in a group of 16, 18, or many more) who were commissioned by the Buddha to remain in the world to preserve the Buddha's teachings until the coming of the next Buddha, Maitreya. (Fun fact: the classic "fat buddha" you see in artwork and charms actually represents Maitreya, NOT the historical Siddhartha Gautama Buddha.) According to Andao Tea, Tie Luo Han (the tea varietal) supposedly originated in the buddhist cave dwellings said to be inhabited by these Luo Han / Arhats, hence its name. 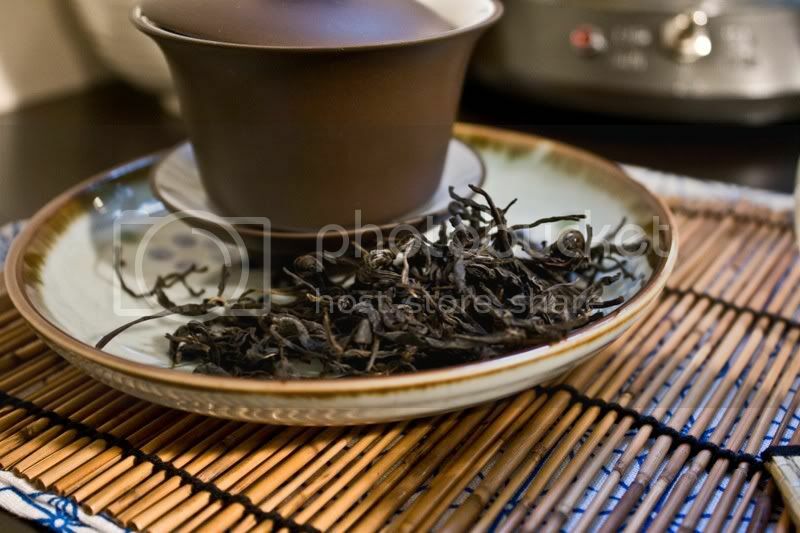 The "tie" part of the name is said to have come from the iron color of the tea leaves. 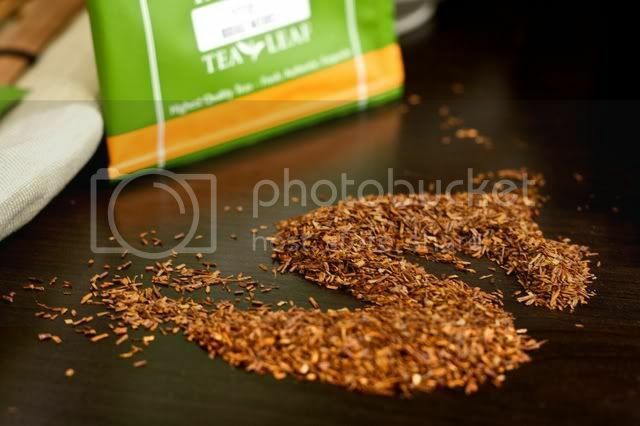 Teacuppa describes this tea as, "Full-bodied and supple, with gentle floral notes and the traditional long-lasting finish." I have to agree completely; this is a fine tea with good body, a nice oiliness on the lips, and classic fruity yancha flavor. The aroma is lovely; mostly chocolate, with a touch of raspberry. The flavor is very similar. Like a lot of Teacuppa's yancha, this is not highly roasted, so there is very little charcoal flavor unless it is brewed with a heavy hand. (As with most Wuyi yancha, I fill the teapot about 1/2 to 3/4 full, then start with ~5-10 second steeps and increase from there.) The flavor is soft and smooth, though I do not mean to imply that it is weak. Yum! Though it isn't very complex, it isn't boring either. It's a nice happy medium, and makes for an enjoyable brew. It is a bit on the expensive side, but fortunately Teacuppa offers it in 15g amounts. I definitely recommend trying a sample of this tea. You may or may not have noticed the new search box (powered by the folks at Lijit.com) here on Tea Nerd, but you will probably be a whole lot more interested when you hear about how awesome it is. This search box now searches not only this blog, but several others that I have selected. This should make it easier for you to find what you are looking for, whether you want to get several opinions on a particular topic/tea/vendor/etc. or have forgotten which blogger wrote an article you remember. In case you doubt my motives, I don't get any kickbacks from the company that sponsors this search. I just thought it might be useful. The rest of you bloggers might like it too, so check it out. 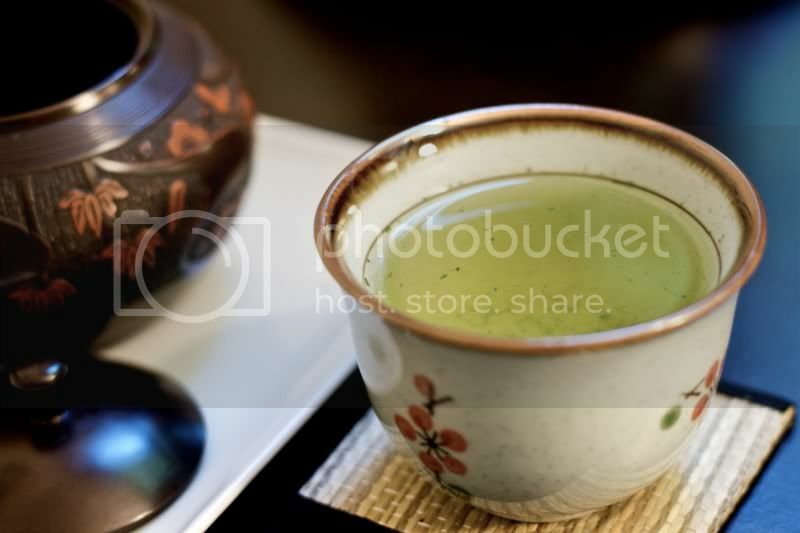 I was very excited to see Hankook Tea Company offer Korean matcha on their site. 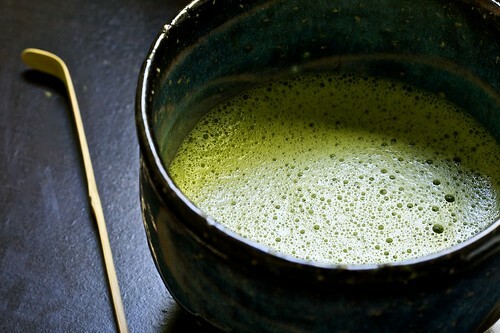 I love Japanese matcha, so naturally I wanted to see what its Korean sibling was like. 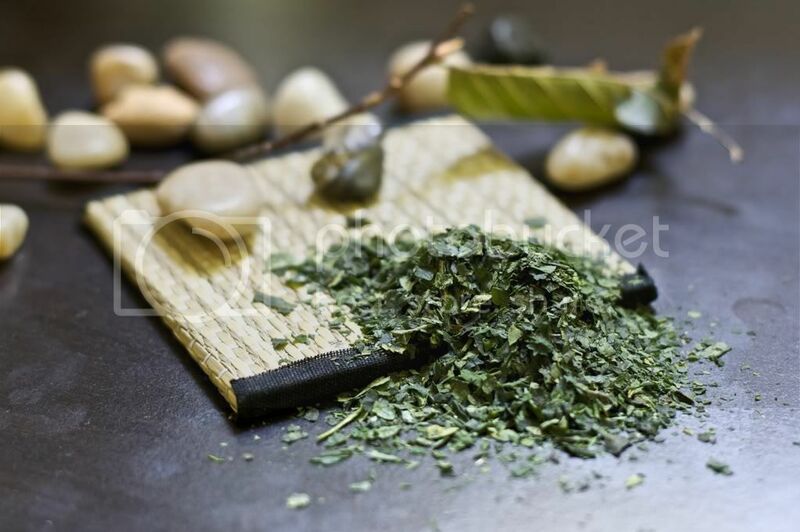 The price seemed good— it is pretty much right in the middle when compared to Japanese ceremonial grade matcha— especially considering the high prices usually commanded by Korean teas due to rarity and the domestic market. Sadly, this example didn't live up to my expectations. The problem is not that Korean teas are inherently bad; they certainly aren't, as evidenced by the lovely sample of Ddok Cha I received from Matt. I imagine the problem is that very little of the good stuff makes it outside Korea, even more so than in China and Japan, probably in no small part due to the small size of the Korean tea industry. This is all unfounded speculation though, so take it with a grain of salt. Anyway, about the tea. The flavor is fairly typical for matcha, though a bit on the tart side and more astringent than I usually like. 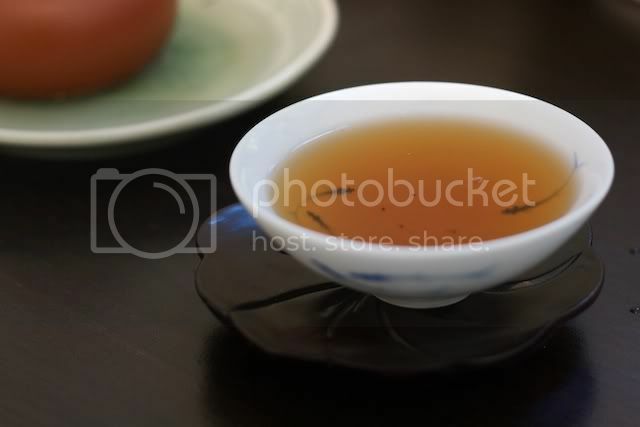 However, it does seem to have some strong "cha qi"; I broke into a sweat soon after drinking it. 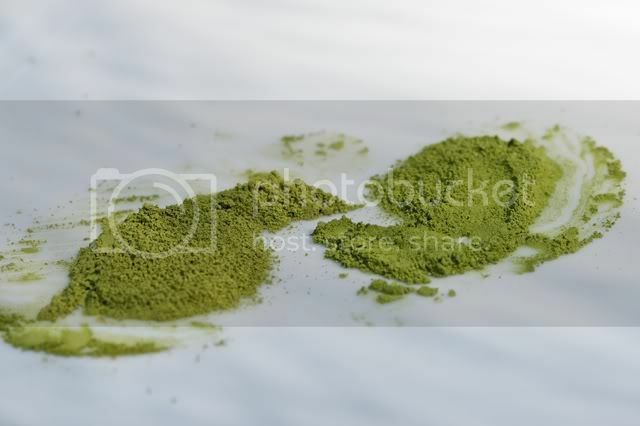 Compared to the other matcha I have on hand, the Wakamatsu-no-Mukashi from Ippodo, the Gamnong matcha didn't do well. To be fair though, these are definitely in different weight classes; the Japanese matcha is quite a bit more expensive, and that's without considering what a product of similar quality would cost in Korea. Here you can see the two matcha side-by-side. The Wakamatsu-no-Mukashi (right) is slightly greener (also older, for what it's worth), and has a more fluffy/ less grainy texture than the Gamnong (left). Both samples here were sifted through a basket strainer. This isn't a bad matcha. It's just not that great, and not different enough from better-valued Japanese matcha (Wow, did I really just say Japanese matcha is a good value?) to justify buying a whole tin. Let me know if you would like to try some for free though; I'd be happy to send some samples. 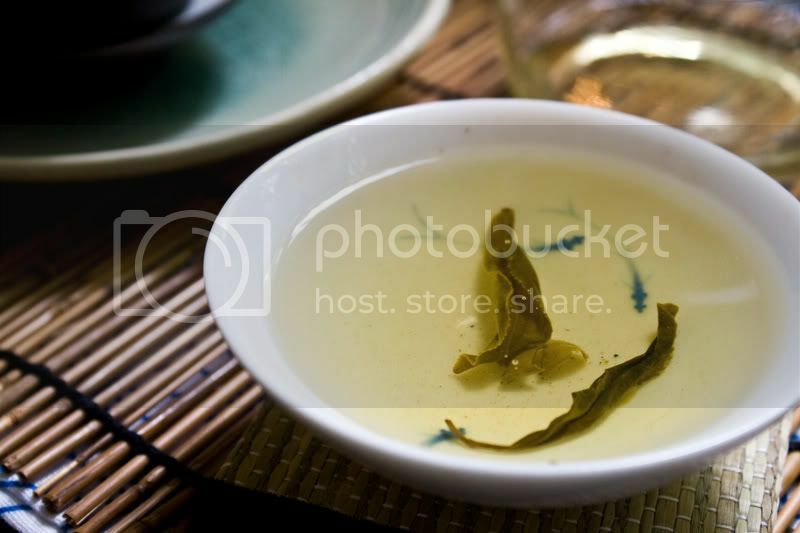 "This hwang (or yellow) tea is fermented half-way from the Chigarok green tea, which a combination of steamed and pan-fired green tea leaves. Cultivated with abundant experience and care, you can experience the exquisite taste and scent from this tea. As usual, I am totally confused about the production of Korean teas. I do have a book on Korean green tea though, which I really should reference at some point; I'm posting about another Korean green (with a twist) soon, so maybe then. Back to the task at hand. Contrary to the vendor's description, I don't smell much of anything in this tea. The dry leaf smells just a bit like milk chocolate, but only if you dive nose-first into the tin. Speaking of the included tin, it's pretty cool. I'm having a hard time figuring out what it is made of, but regardless it seems like a good tin. 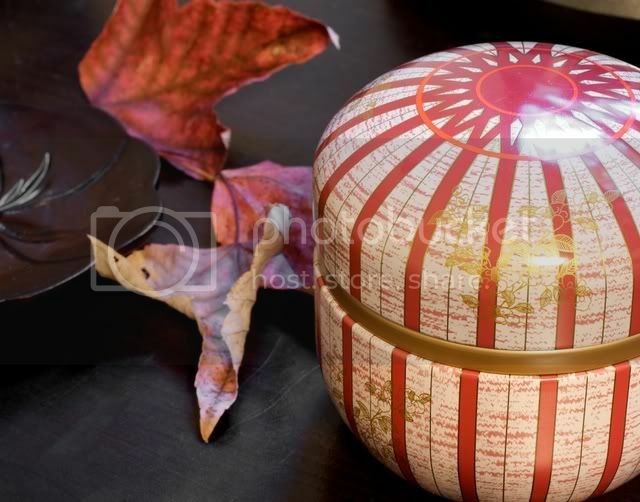 It has an inner plastic lid beneath the outer lid, which helps keep it airtight. It's probably not as well-built as some other tins, notably Rishi's and O-Cha's, though. Though I usually prefer to brew wrong-fu style, this tea is much better when less leaf, more water, and more time are used. When brewed in an infuser cup, such as the one I ordered from Hankook (which is the subject of yet another upcoming post), this tea is tasty. The flavor is best described, by my limited palette and vocabulary anyway, as chocolatey with a healthy dose of nuttiness. It isn't very complex, which is a bit disappointing considering its price, but it is a solid and drinkable tea that doesn't require much thought to brew or enjoy. It endures a quite respectable number of infusions too, even when brewed western-style in an infuser cup. All that said, I can't recommend it, unless you have some money burning a hole in your pocket. While good, it sure isn't worth this staggering price. I have heard great things about Just4Tea's Tie Guan Yin (particularly from Alex's blog post), so I took the plunge and bought some. Let me tell you right off the bat: this is an excellent tea that competes in a price range well above its own. 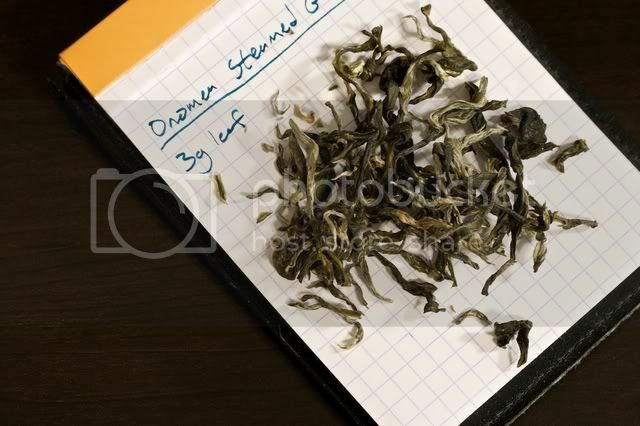 Just as Alex expressed in his review (linked above), I consider most Tie Guan Yin to be relatively lackluster, especially when compared to heavy-hitters like Wuyi yancha and Fenghuang dancong. 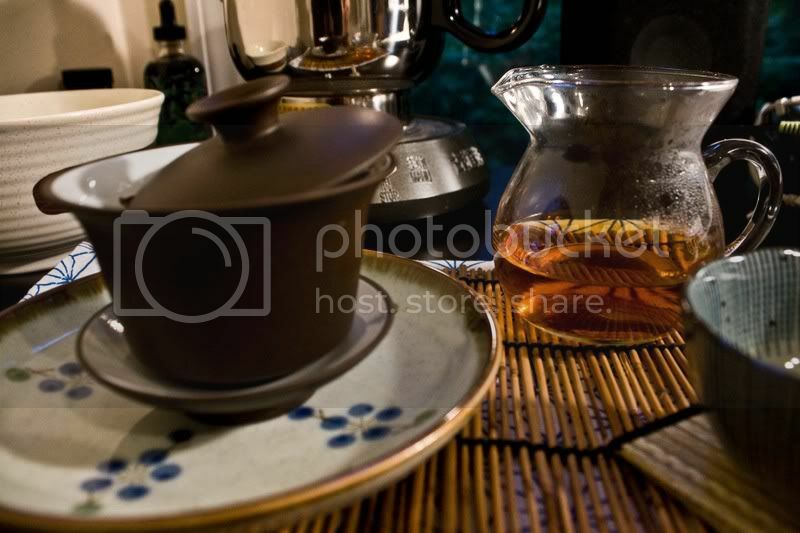 This tea, however, is different; perhaps because it seems to have so much in common with Wuyi yancha. 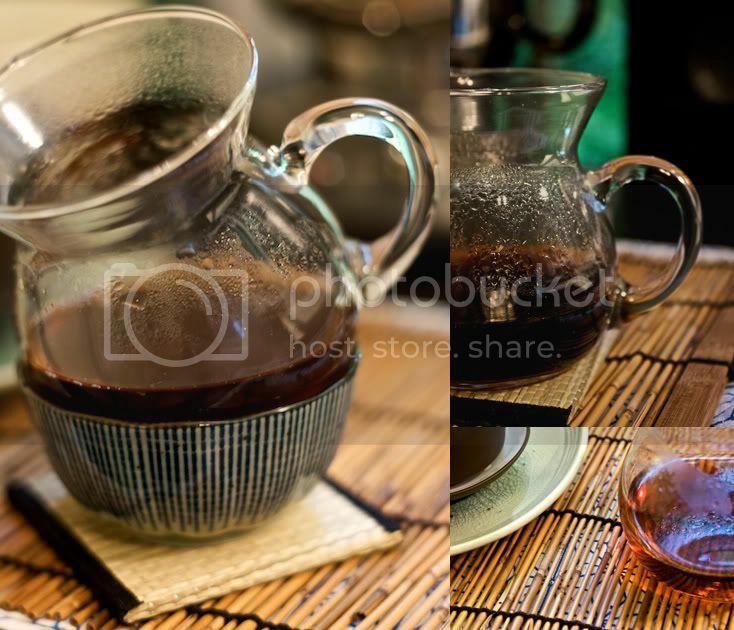 This tea is heavily roasted, as you can see in the photo above, just like a lot of yancha. 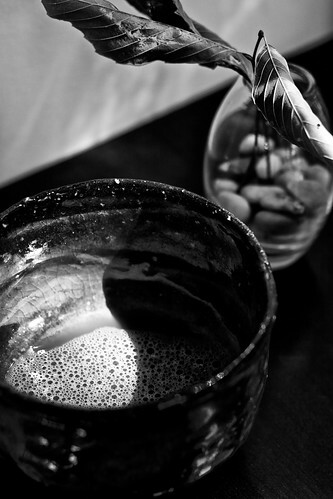 I brewed it in my TGY pot, and put in enough leaf so that the vessel would be filled when the leaves expanded. I started off with a ~20 second infusion to open up the leaves, then dropped down to ~5 seconds, and went up from there. 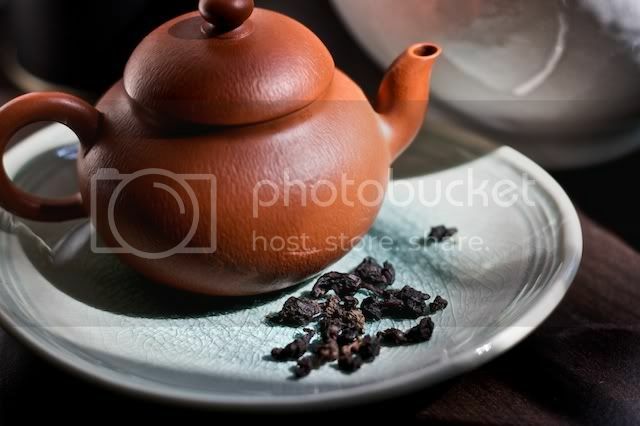 It tastes a bit chocolatey, a bit spicy, and sometimes fruity (though I think you need to stuff the pot to get good fruitiness); it shares a lot in common with Rou Gui. 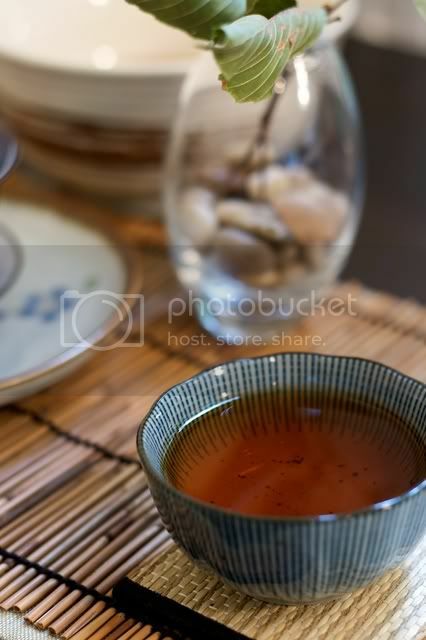 It also has some of the classic silkiness and oiliness that I love about good yancha. However, it still retains some TGY character, as Alex noted. 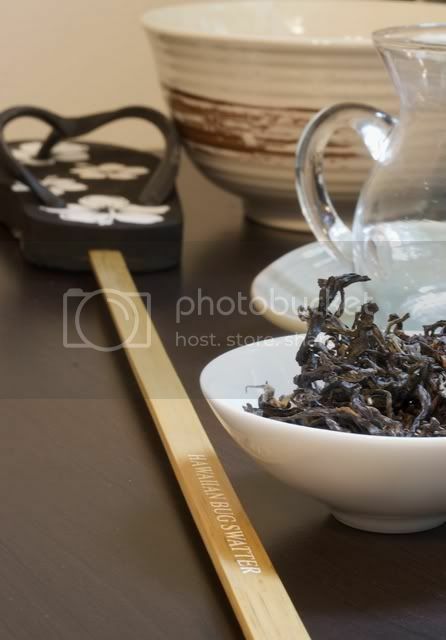 It has a base of toasted grain flavor and the fruit flavors are more like those found in TGY than other oolongs. Despite the high roast, this tea is not at all heavy on the fire or charcoal. I think the time that has elapsed between Alex's review and my own has done good things to this tea; it seems to be much mellower now. Thanks are due to Alex for the recommendation; I never would have tried it otherwise. This really is a diamond in the rough! 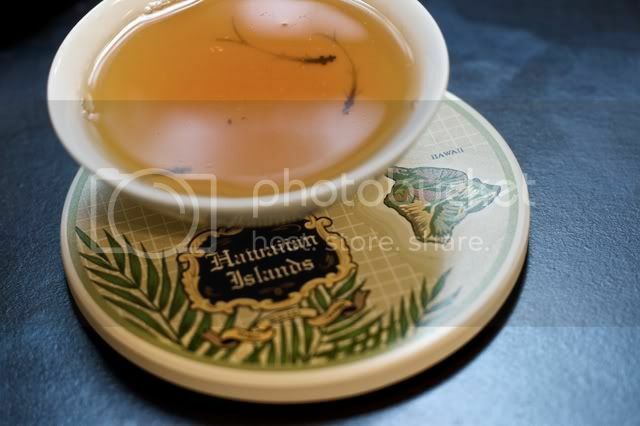 I recently tasted two Hawaiian teas from the Onomea Tea Company, located near Hilo on the big island, courtesy of Victoria who recently visited their farm. I received two samples (very generous considering their astronomical prices) of oolong and steamed green tea. 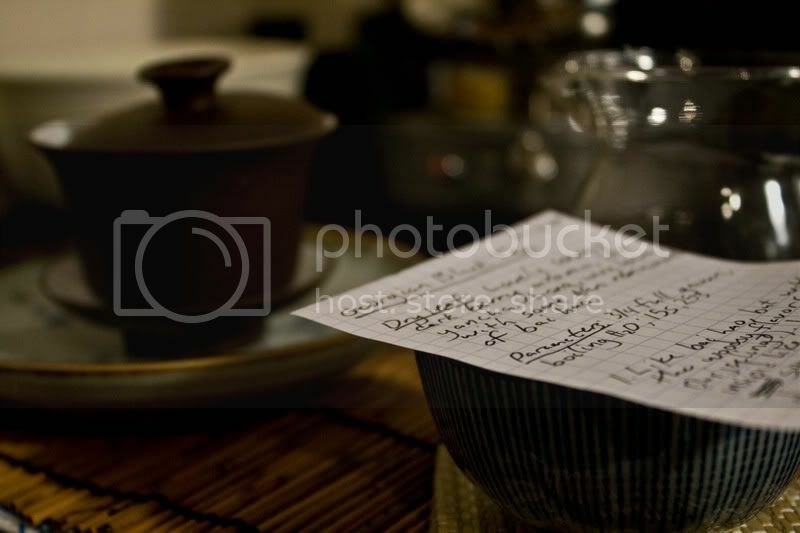 First, my notes on the oolong. Pictured with the dry leaf is my Hawaiian Bug Swatter; basically a mini-flip-flop on a stick. My girlfriend asked me to bring her gifts from the ABC Store, so I reluctantly obliged; this was one of the results. The dry leaf is gorgeous; the picture does not do it justice. There are more white tips and there is a more attractive texture than is shown here. They don't smell like much at all, though there is a hint of pickled ginger aroma. I brewed these by dumping the whole sample (9g) into a gaiwan and brewing with boiling water in short— around 20 seconds to start— infusions. The resultant liquor was peach-colored, and woodsy-flavored. Sadly, this tea isn't all that great, which came as a bit of a surprise after my positive experience with the steamed green (see below). It is pretty much all woodsy flavor, with moderate astringency. Someone in TeaChat noted that oolong is much more difficult to make than other teas, and it would seem that these new tea tea makers will need more experience (not that I claim to have it; oh the luxury of being a critic!) before they produce some decent oolong. 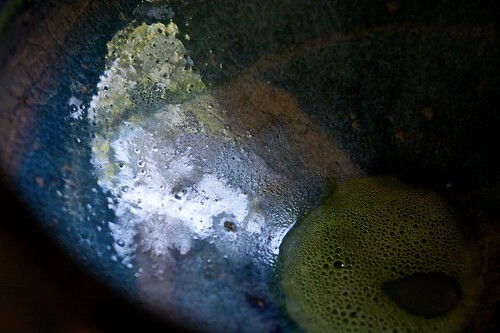 Evidence of this is seen in this photograph; the two leaves are very different colors, showing a large unevenness in oxidation. There could be as much as a 30% difference between these two leaves, something you almost never see in quality Chinese or Taiwanese oolongs. Variation in color on one leaf is usually fine, but when different leaves are completely different colors like this, it is not a good thing. 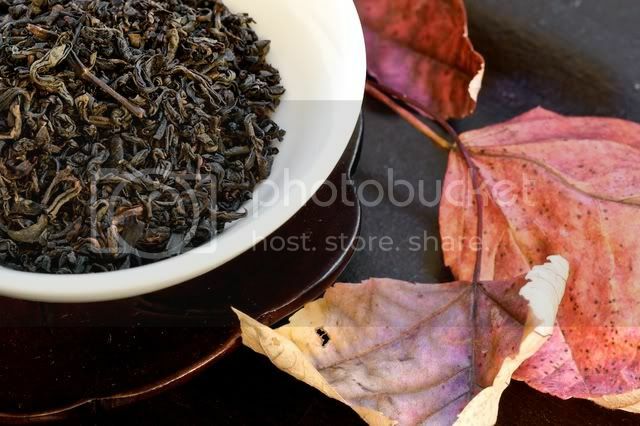 These dry leaves, much like the oolong, are absolutely gorgeous. When I heard Victoria mention "steamed green tea" I pictured something decidedly more sencha-like, so I was (pleasantly) surprised to see these. They smell *just* like pickled ginger, which is quite a unique aroma for an unflavored tea to have. I brewed 3g, 170-175°F in a 100mL gaiwan; steep times were 90 seconds, 140 seconds, 180 seconds (after this I stopped paying attention to timing, but got a couple more brews in before it got to the sweet-water point). This is a smooth, sweet, creamy tea. There is not a lot going on in the flavor or color department in the first infusion, but it soon wakes up and gives a soft pickled-ginger taste and aroma, which is really very nice. If you like the pink (or white, if it's homemade— there's a fun fact for you) stuff that comes along with your sushi, you will like this tea. Besides that, though, there still isn't a whole lot going on. 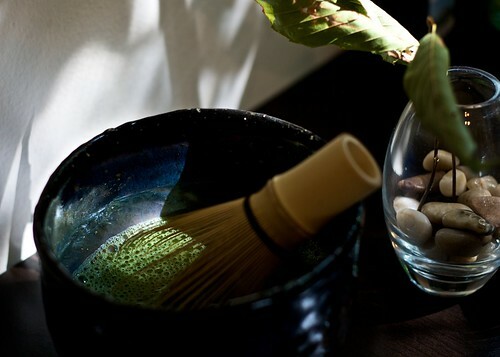 I didn't think this is anything like your typical Japanese steamed green tea; it is quite unique. 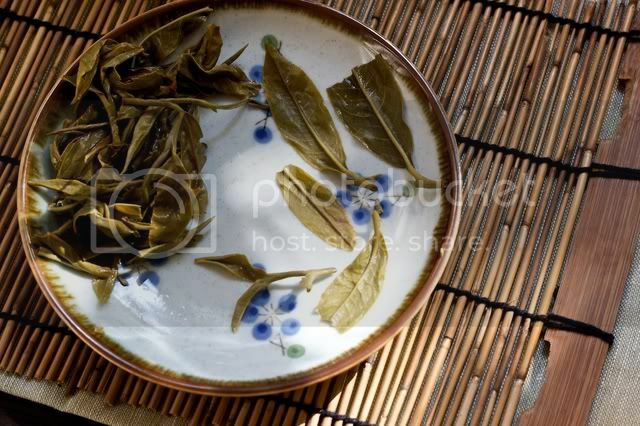 The amount of care that has been put into the production of this tea is obvious; the wet leaf shows that full leaves were carefully handled and processed to make this tea. These puppies are thick, pliable, and leathery; is this because the plants are so young, I wonder? Anyway, while this tea is quite interesting, I'm not sure it would replace sencha as my favorite. Still, it will be interesting to see how this tea develops as the plants age and take on some character. Though I wasn't all that impressed with the oolong, I was surprised by the quality of the steamed green tea and the amount of love that these new tea producers have clearly folded into their products. Thank you, Victoria, for the samples; I always love trying teas from new places! After trying and loving the Georgian Old Gentleman (also from this vendor) given to me by Mary, I ordered 100g of it and a sample of it's female counterpart, Georgian Old Lady. It is also a Georgian tea, obviously, though from a different village. This one is crafted by a woman named Natela, whose picture you can find on the product page (behind a link near the bottom). The vendor's comparison of these two teas is pretty accurate; this one does seem to have more golden buds than the Georgian Old Gentleman. As excited as I was about Georgian tea after my first encounter with it, I was a bit disappointed by this one. The dry leaf has a floral, woodsy aroma that is lighter than that of G.O.G. I brewed it pretty much the same way I brewed it's hubby: I filled the vessel with leaf, used boiling water, and 15s steeps to start. This is very much like a bai hao / oriental beauty, more so than G.O.G. It is woodsy in a sort of sharp herbal way that I can't really think of the right words for; if you know your bai hao or Darjeeling, you probably know what I'm talking about. 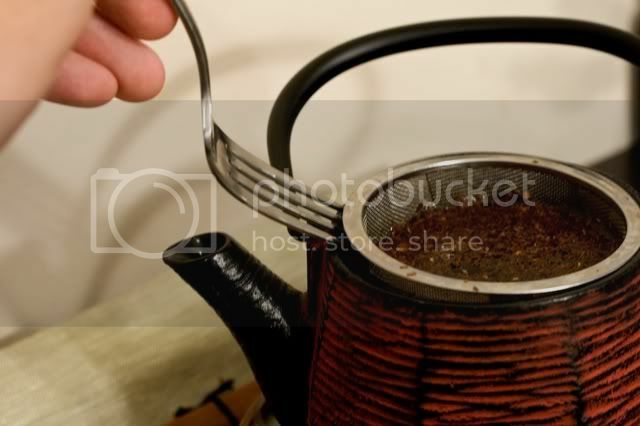 It lacks the body and deep flavors of Georgian Old Gentleman, which I thought were some of the best features of that tea. As should be readily apparent, I do not think this is as good as the Georgian Old Gentleman. It isn't bad, but it isn't great, and it just doesn't suit my tastes. Still, it's worth trying a sample of it; Nothing But Tea gave me a generous sample considering the low cost. On an unrelated note, I had a little fun with reflections during this session. I don't love the composition, but the effect was pretty cool. Origin: South Africa, I think. Read Mary's blog for more info. I thought I'd swirl this into a nice pattern, but it just ended up looking like a farting dragon. Could be worse, I guess. 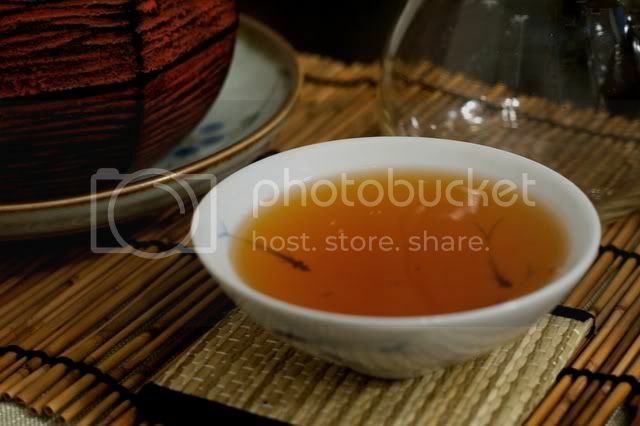 Alright, first off, I don't want this to be viewed as an anti-Lupicia post; I like all the teas I have had from them, and their Japanese greens in particular are quite good. Anyway, on with the notes. The dry leaf smells like NyQuil. Not necessarily a bad thing; NyQuil is soothing and helps you fall asleep when you are sick, which is all good. 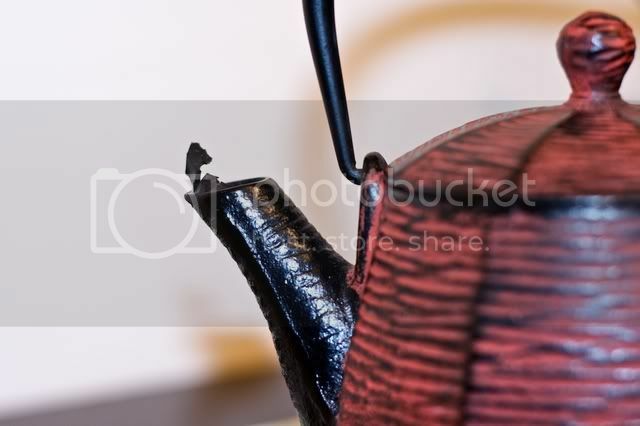 I decided to steep this in my neglected tetsubin teapot which I now know has fallen into a state of disrepair; the enamel on the interior of the spout seems to be peeling off. Not a big deal, but it added to the weirdness of this whole tasting. I also used an infuser basket for probably the first time in a year (or two). Man, I hate these things. I brewed it for about 5 minutes with boiling water, using all the leaf (Stem? Grass? What the hell is this crap anyway?) you see in the picture above. I think the pot is around two cups, but I really have no idea. The resultant tea smelled and tasted like a NyQuil bush. Imagine NyQuil in grass form, sprinkled with anise (another thing I dislike). I'm not going to lie; I have been eyeing this tea since week one of my loose-leaf tea journey. My tastes may have changed since then, but it was a great pleasure to finally try this tea, courtesy of fellow TeaChatter Pentox (A.K.A. fellow blogger Eric). Thanks for the oppportunity, Eric! 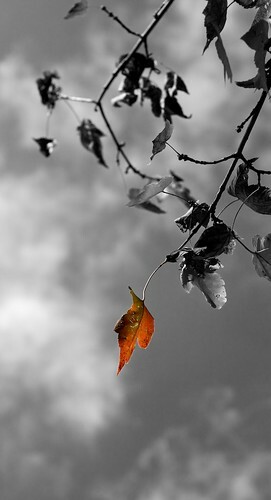 I highly recommend clicking on this picture to get a good look at the leaf. So delicate! 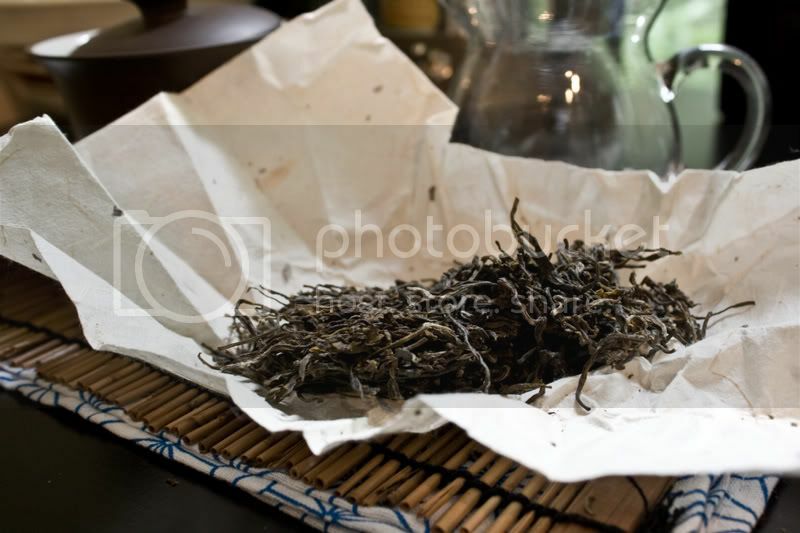 Tencha is a fairly rare tea to come across (Harney & Sons say this as well, but very rarely is a vendor's claim of rarity true), as it is not produced as an end product. 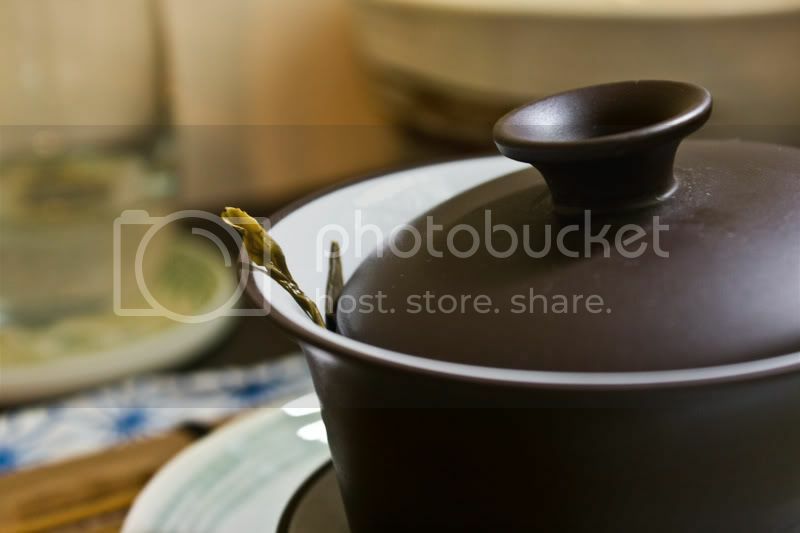 Rather, tencha is an intermediate step in the production of matcha. 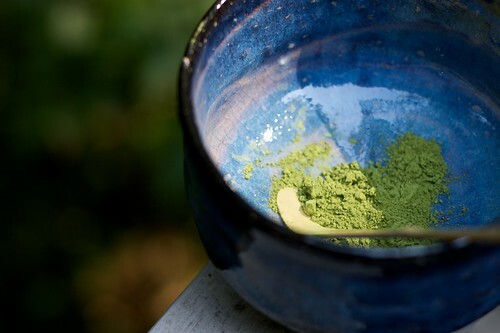 While some shade-grown tea leaf is being rolled and processed into gyokuro, the rest has its stems and veins removed, resulting in tencha, and is finally ground into matcha. I suppose, then, it is not all too surprising that this tea smells and tastes a bit like a cross between gyokuro and matcha. 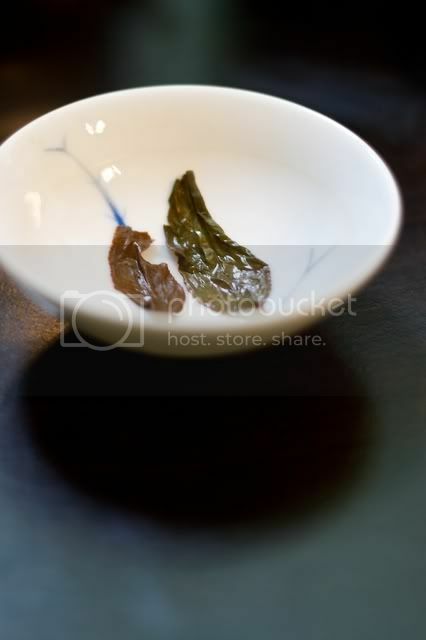 The dry leaf smells mostly like gyokuro, but is not nearly as vegetal. The first few steeps were much like gyokuro, but the fourth tasted exactly like matcha, just with all the bits filtered out. As far as parameters go, I brewed this for minute-long infusions until that wasn't enough, at which point I doubled it. I used 5g of tea in around 5oz of water. I tried 150°F first, but that was too high and resulted in that nasty, overbrewed gyokuro taste. 135°F was the sweet spot for me, giving a lovely, sweet, candy-like liquor. 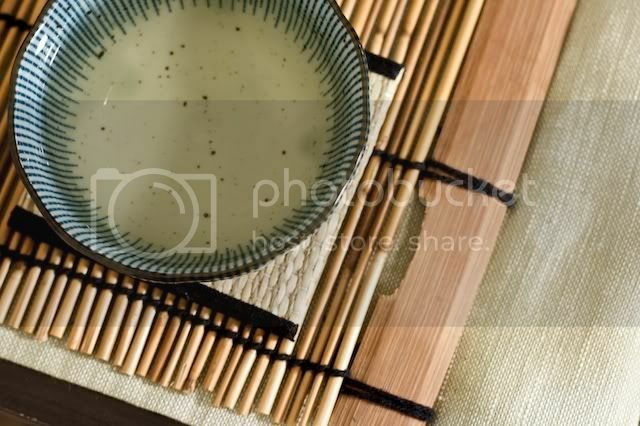 And this is coming from a guy who really doesn't like gyokuro. Anyway, I'm just rambling now, so let me conclude. This was a very interesting tea, and tasting it helps one understand the connection between gyokuro and matcha. It tastes quite good too, but I'm not sure it tastes good enough compared to a quality sencha or gyokuro to make me want to buy a huge tin all for myself. Thanks so much for the sample, Eric! Eric's notes on this tea can be found here. Meet _______, my new friend. I just picked up my first houseplant today. 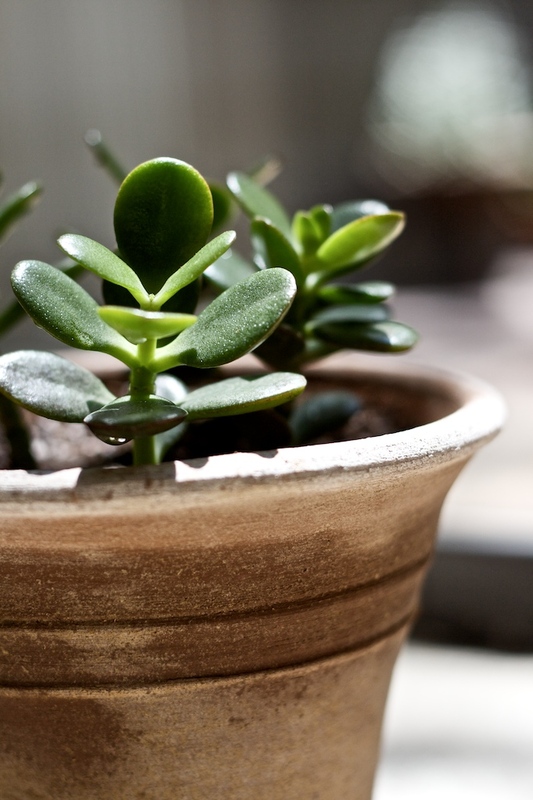 It's a jade plant, and it's just a baby right now, but it should grow into that pot if I don't kill it first. On that note, I thought I'd ask you all to help me name him (Yes, it's a him. My girlfriend and I decided to give it a male name so she doesn't get jealous of how much time I spend with it). I thought I'd go with the name of a mythological figure who is either prophesied to die or dies despite the best intentions/precautions/etc., as I expect this poor little plant to share the same fate. The two names I am considering at the moment are Acrisius (thanks Mary), an ancient Greek king accidentally killed by a discus thrown by his grandson, and Baldr, a Norse god killed by an arrow made of mistletoe (the only thing that could harm him) that Loki, another god, tricked Baldr's brother Höðr into shooting him with. Let me know if you like one or the other better, or if you have any other ideas because frankly, neither of these names is all that pleasing to the ear. Thanks! No, not drugs, something much more innocuous (but still very much appreciated): six photo prints and three shu puerh samples from VL. 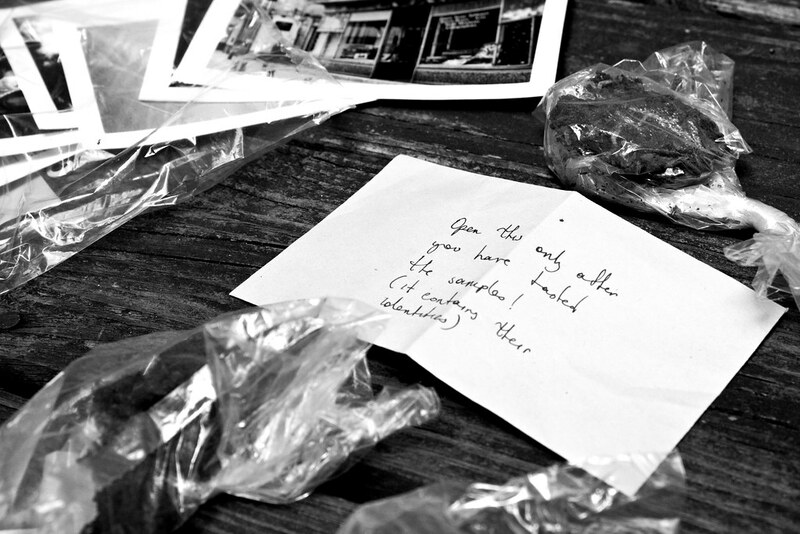 Also included was an envelope containing the teas' identities, which I was not to open until after I finished tasting. From left to right: sample A (2007 Menghai 0532), B (2005 Menghai Golden Needle White Lotus), and C (2006 Menghai Li Li Xiang). Sample A, which I now know by its preferred name of 2007 Menghai 0532, was quite nice. It was dark, though I think I used too much leaf; I haven't brewed puerh in a while, so I'm not exactly at the top of my game. Still, it tasted surprisingly light and fruity for such a dark, opaque tea. There is very little off-flavor to speak of: almost no pond, and no "industrial" taste. It is malty, sweet, and delicious if brewed right, and has good oiliness and mouth-feel. It also lasted quite some time, though again probably due to my inept over-stuffing of the gaiwan. Clockwise from the left: Sample C / 2006 Menghai Li Li Xiang, Sample A / 2007 Menghai 0532, and Sample B / 2005 Menghai Golden Needle White Lotus. 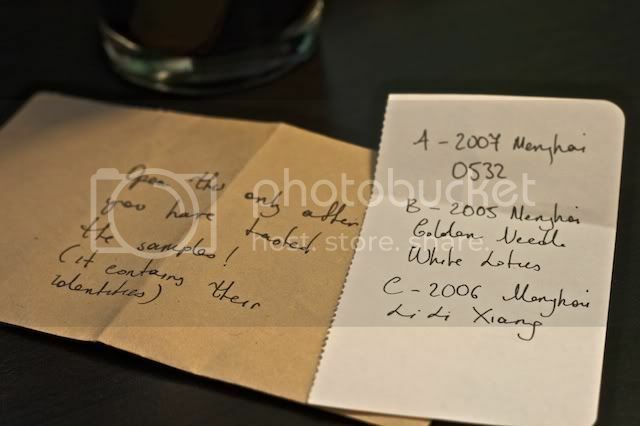 Sample B, the 2005 Menghai Golden Needle White Lotus, was my favorite of the three. It was lighter (reddish-brown, not dark brown like the others), had good clarity, and tasted much more like aged sheng than most shu. It had a clean woodsy flavor (like a "forest after rain" as I recently saw Salsero put it), and no off-flavors at all. It also had a lovely minty/cooling hui gan, and lasted a number of infusions. Sample C, the 2006 Menghai Li Li Xiang, was probably my least favorite of the three, but it was still quite good for shu, if my memory serves me. 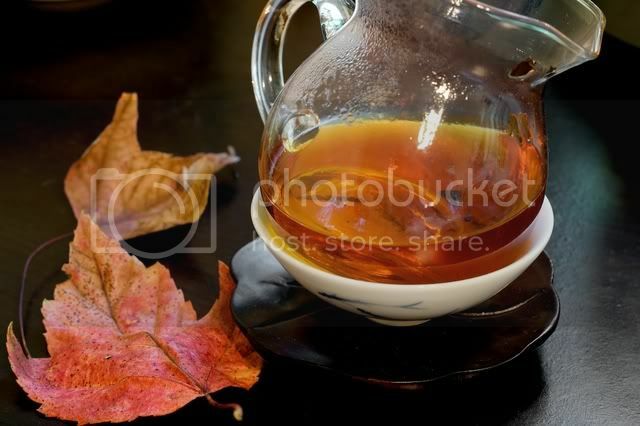 This was also a pretty dark brew, though I am certain I used too much leaf this time— far too much. I pulled out a good half-gaiwan full, which fortunately had only been brewed once or twice, and the tea improved dramatically. It was sweet and "soupy," for lack of a better word. It was also woodsy and had a nice hui gan, though not as clean or as nice as what sample B offered. It wasn't pondy at all, but perhaps a bit salty/marshy... still, that description doesn't do it justice, as it was not an unpleasant flavor at all. Looking back a few days later, I want to use "savory" or "umami" to describe it, but I can't be certain. 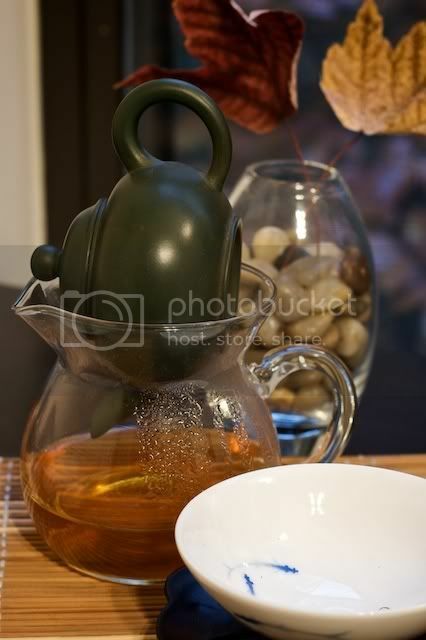 The tea seemed to be a little muddled, not very crisp, though this improved as the flavors diluted in later infusions. Thanks again to VL for the prints and the samples! It's amazing what light you can catch in the morning, if you look. 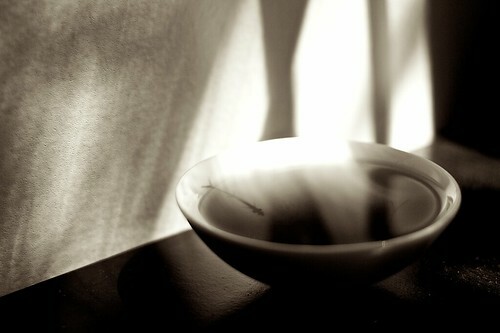 A warm, soothing cup of lao cong shui xian. Vendor: Unknown. This was a gift from Matt, of MattCha's Blog. Many thanks are due to Matt, who provided me with a generous helping of this Ddok cha. I don't really know what it is (other than pressed green tea, more info here [Edit: Also here]), but it is fantastic and exactly what I should have expected Matt to give (more on this later). 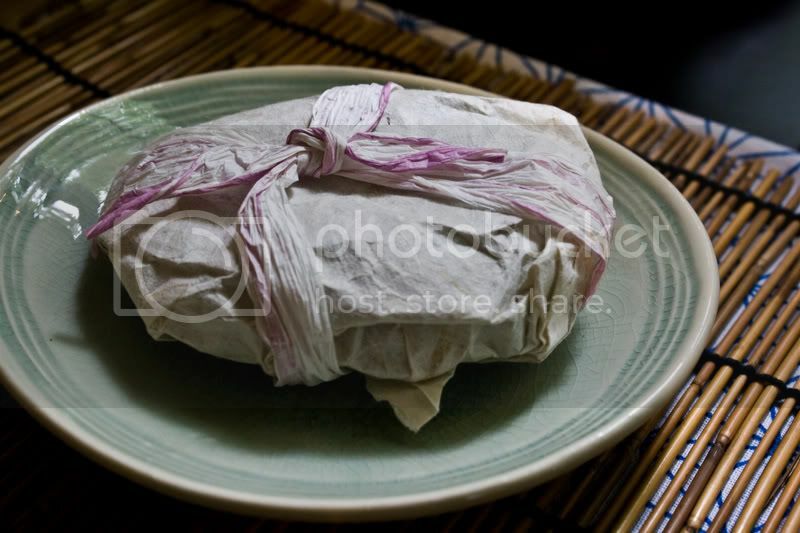 Unwrapping the package, one finds something that looks quite a bit like puerh. Again, this used to be more cake-like (though with very loose compression), but not after I had my way with it. The dry leaf aroma is quite faint, completely unlike puerh, and smells like a Korean green tea; creamy, sweet, and grassy. It tastes similar to how it smells; light, creamy, only slightly grassy, with an occasional hint of banana. Still, while it is soft and comforting, the flavor is not the highlight of this tea in my opinion. I do not have much skill in feeling cha qi, but this is easily the most pleasant cha qi I have ever experienced. It comes on slowly and has some strength, but it is not at all jarring or obnoxious. I feel incredibly comfortable (yet still alert) when I drink this tea. As I mentioned earlier, this is exactly what I should have expected from Matt. This is not an in-your-face, full-flavored tea (like what I typically drink). 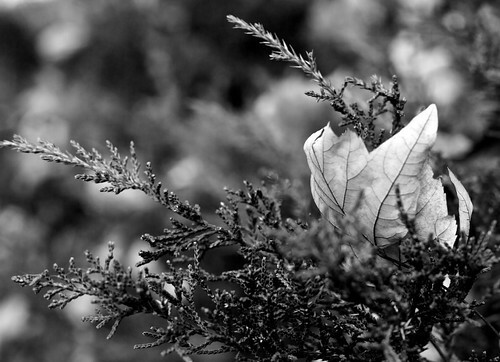 Its beauty is much less obvious, even "shy", and could easily be missed if one is not attentive. Thank you again, Matt, for this eye-opening tea; it will not soon be forgotten. Sorry for the lack of posts lately; I've been working on med school applications and moving into my new place. I have been allotted a small cupboard for my tea stuff, and I have room on my desk for a modest setup. The first tea I've concentrated on since arriving is this Georgian (the country) black tea, courtesy of Mary R. I am not usually a fan of black teas, but this one was a big surprise. 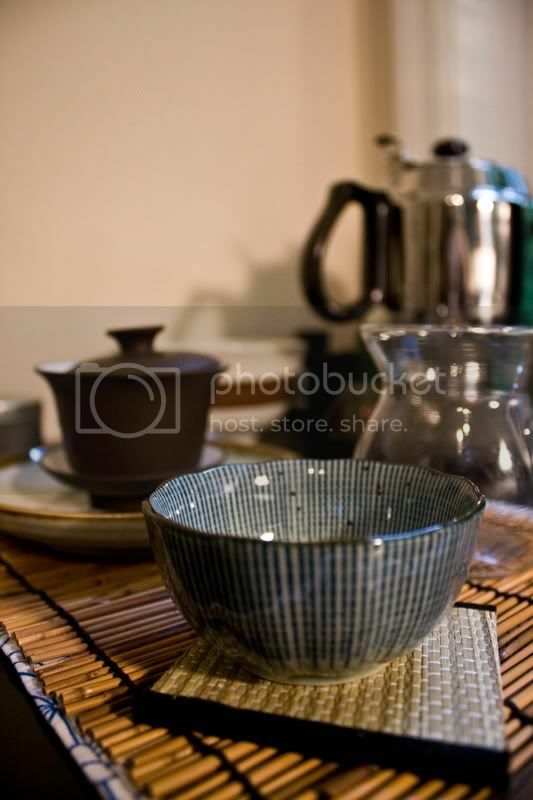 As you can see, I have chosen to use a gaiwan for this session. I filled the vessel about 3/4 - 7/8 full, as the leaf is very loosely packed, and started brewing with a 15 second infusion (which may have been a little short) using boiling water. The dry leaf is long, thin, and twisty. There are some white and golden tips, but for the most part this tea is very dark. 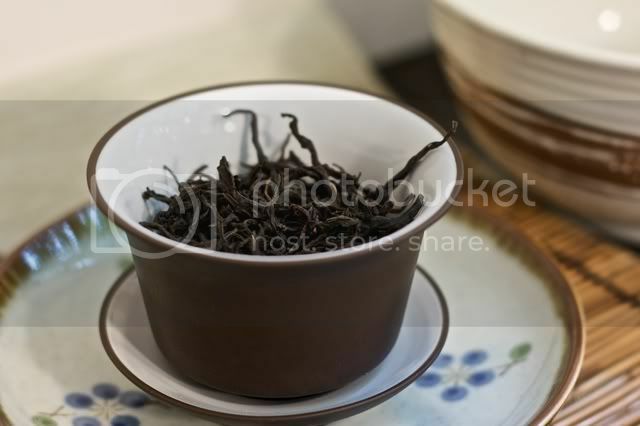 The dry leaf aroma is similar to yancha— chocolate and berries— but also smells a bit like Oriental Beauty / bai hao. The liquor tastes like a more full-bodied bai hao or Darjeeling to me, though with more sweetness and less of the woodsiness than I typically associate with bai hao and Darjeeling. I generally don't like black teas, especially when brewed gong fu style, but this is lovely! I believe Mary and others have commented on how oolong-like this tea performs, and I have to agree. 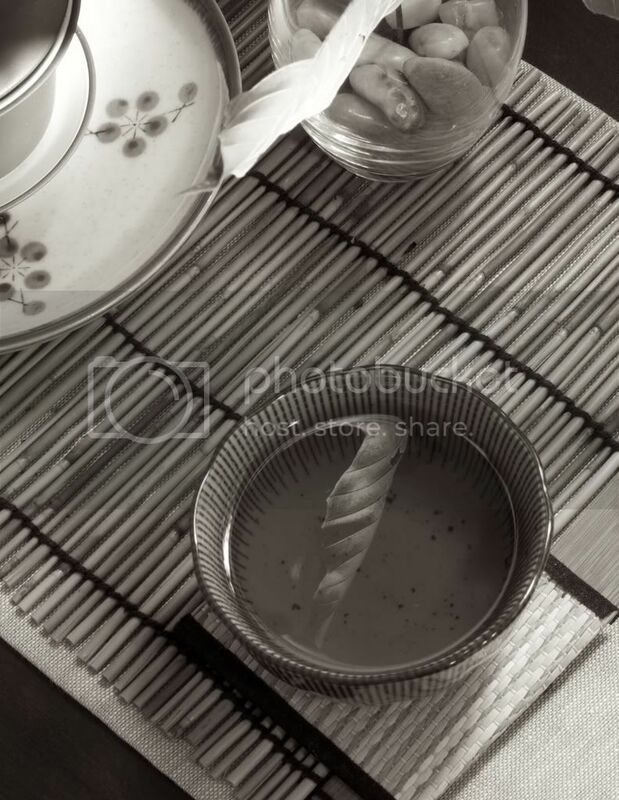 The tea leaves a slight drying sensation on the tongue. Best of all, I do not get the headache that normally comes from Darjeelings! Mmm, tea. Thank you Mary!